Experts remind that bladder cancer is the most common malignant tumor in the urinary system, to which, patients should live up to early detection and early treatment. The followings are some treatments for bladder cancer introduced by experts from Modern Cancer Hospital Guangzhou. 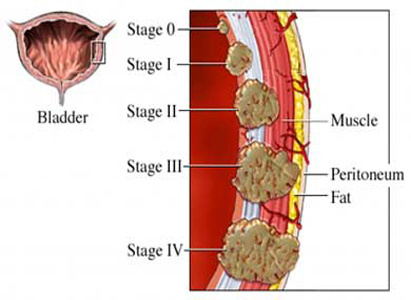 Surgery is the main treatment method for bladder cancer, while the specific operation scope and method should be based on the stage, histologic type and malignancy degree of the tumor. And a comprehensive analysis on the size, location and involvement condition of adjacent organs should be done before surgery. General speaking, radiotherapy is applied before or after operation. To advanced stage cancer patients who have lost the chance of surgery and those who refuse to undergo surgery, or cases of postoperative recurrence, palliative radiotherapy can also get a certain therapeutic effect. Chemotherapy for bladder cancer patients includes intra-bladder chemo infusion, systemic chemotherapy and intra-arterial chemotherapy. Selectively taking chemotherapy before or after operation can increase the treatment effects and improve the quality of patients’ life to a large extent. Traditional Chinese medicine can be applied through the whole course of bladder cancer treatment. Used alone or combined with operation, radiotherapy and chemotherapy, traditional Chinese medicine can suppress the tumor and improve the quality of patient’s life. Minimally invasive therapy is a modern and high-tech minimally interventional treatment method. Under the guidance of medical imaging equipment, a special catheter, guide wire and other precision instruments are introduced into the body for lesions diagnosis and local treatment. Minimally invasive therapy possesses the superiority which traditional therapies don’t. In addition, experts from Modern Cancer Hospital Guangzhou also give patients radiotherapy, chemotherapy or traditional Chinese medicine planned and reasonably in accordance with their individual condition simultaneously, when they are applying interventional techniques. This can significantly improve the therapeutic effect and patients’ quality of life, and prolong their survival time as well.